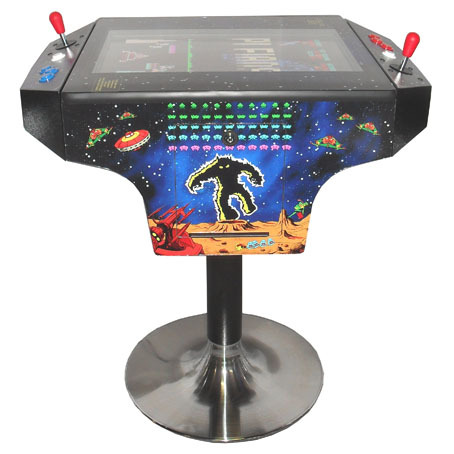 Our Arcade Table has all of your Classic Arcade Game favourites in one complete unit, challenge your friends to see who the arcade master really is. Play all of your favourites like Pacman, Galaga and Space Invaders, a fun time to have with all of your family. 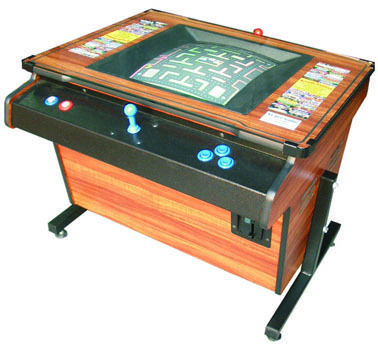 The Classic...Our best selling machine and the best Table Top on the market. This machine is available with or without the coin acceptor, the same manufacturing process is used whether you are going to use the machine commercially or just for home use, this machine is built to last. Comes in a large number of colors or we can Custom make it just for you and your decor. The Elite...was designed for sheer Elegance and Class. Nothing but the best components were used as you can see in the picture, this machine says "Play me". Theres no other Table Top on the market like this or even close (until they start to copy us), the pictures just don't do it justice. 19 inch High Resolution LCD Monitor, Competition Buttons and Joysticks. Chrome Pedastal Base. Stunning Graphics. Sold with two matching Chrome stools which are height adjustable. The Timber is 18mm melamine, various colours available. The Control panels are 2mm MS powder coated Black. All holes are laser cut for accuracy. Legs are 2mm MS powder coated Black. 2 height positions are standard. Levelers are fitted to adjust for uneven floors. There are five air vents for cooling on the cabinet.